It has been hot and dry here lately. Typically we get late afternoon thunderstorms that cool things off and moisten things up, but not so much this year.The lack of water has made things peter out sooner than usual, and looking around, I am realizing, I don’t have that much that blooms late summer. I need to get to work on that. The asteraceae family does well in the dry heat- purple coneflowers and daisies and black-eyed susans have been blooming their heads off, and attracting pollinators for a few weeks now. 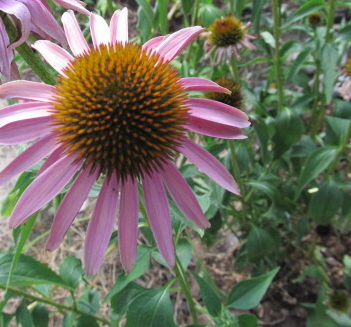 I don't deadhead the Echinacea (purple coneflower) because the birds like the seeds. What the birds don't eat will self seed and grow next year. The herbs are the pollen workhorses- bees are all over the lavender, anise hyssop, oregano, thyme and mints.Not much to look at, but the bugs sure love them. 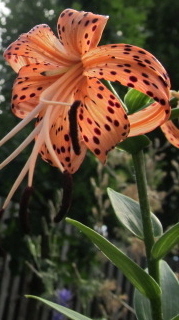 I have one tiger lily blooming right this minute, and I want to order about a gross of late summer lilies. I had some other oriental lilies that have already finished blooming. 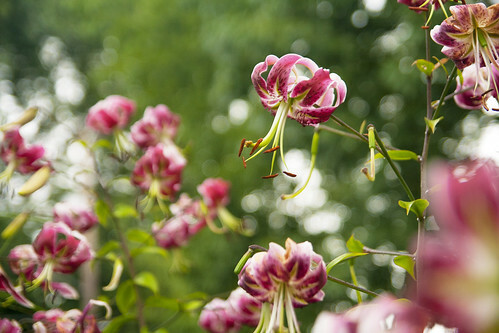 Never liked lilies before, but they fill an important role in late summer. Orange is never my first color choice, but they just fit this weather and this time of year. Wait, a gross of lilies, that’s a gross of holes to dig. May have to rethink that plan. edited to add- I noticed some sweet peas still blooming- which I have always thought of as cool weather flowers- but no, it’s crazy hot and dry, but those little old fashioned sweet peas are still blooming. Hooray. I have butterfly bush and Phlox (David) blooming in my yard. My annual zinnias, cosmos and marigolds are going crazy too. I’d recommend ‘Black Beauty’ as another late-blooming lily…it’s just amazing and blooms for about the whole month of August for me 🙂 Here’s a shot of my small patch this year.